Yesterday, 22 April 2012 was the Earth Day. It was time to recap how well we have been treating our earth in the past year. A study conducted by Moore Recycling Associates Inc. shows that more than 91% US citizens can recycle their plastic bags locally; while other types of plastic, like flexible plastic wraps, can be recycled in their communities. There are about 75% Americans have the recycling access to the latter one. Some big companies, like Target Corp. and Honest Tea were participating in the effort of encouraging people to recycle more. Target Corp has been giving discounts on sustainable products in the whole month of April and Honest Tea is holding a national event called “The Great Recycle” on April the 30th in NYC’s Times Square. On April 15, a 21-foot tall 15-foot wide chandelier made of thousands of used plastic containers was displayed at NYC’s World Financial Center Winter Garden. 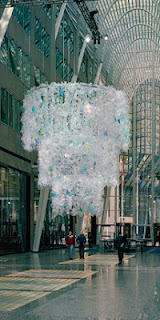 The artist Katharine Harvey – who is well-known of turning plastic wastes into art – was the creator of this amazing chandelier.